Out of those dark days, a new organization has arisen: The Dream Foundry. 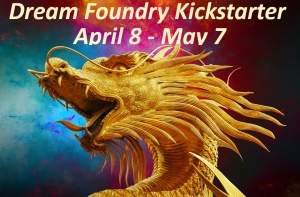 Their mission is to support and promote SFF creators across their careers, starting with mentorship and a judged contest for new writers 2 The Dream Foundry has been created by and for SFF creators – there are no outside interests or motives, beyond improving this ecosystem we all live in, and helping welcome every new generation of writers into the SFF community! Today, the Dream Foundry kickstarter has gone live. At the time of posting, less than 1 day in, they’re over halfway to their goal. But that first goal is just the basics. With enough money, they can start piloting their contest right away. All their goals and costs are laid out on their page. Check out the Kickstarter, earn some fun rewards – and most importantly, help make speculative fiction a more welcoming place for new creators. Oh yeah, and there’s a critique by some familiar names at the $150 Aerial Patrol support level! This entry was posted in Admin on April 8, 2019 by bckinney. Good news for all you writers out there: starting immediately (last update February 5, 2019), Escape Pod is changing their rejection letters to a newer, more transparent pattern. Escape Pod rejection letters will now be explicit and transparent about exactly where your story got in our editorial pipeline. For the last two years, the letters contained that information, but to interpret it you needed to read my website. No longer! That means you’re free to stop reading this post right now, its information is no longer necessary. But if you crave a deeper knowledge of rejectomantic arts, feel free to continue onward. An Associate Editor passed your story up to the Assistant Editor. The Assistant Editor (me) held it for a second read. The Assistant Editor passed it to Co-Editors for the final round of consideration. Associate Editors read each story anonymized1, but the Assistant Editor and Co-Editors can see the author’s name and cover letter.2 This process gives each story an initial read where it must stand on its text alone, while still allowing the cover letter to play a role, especially if the author has experiences relevant to the story. The new letters also provide approximate statistics about the stages of our pipeline (“about X% of stories reach this level”). We hope this context will be useful, especially for new authors. Rejection “level” is not an indication of story quality. It only tells you what it says on the proverbial tin: whom in our staff thought it might be a good fit for Escape Pod. Unlike in the past, reprints and originals now receive the same rejection letters. Did we think a comment would help this story or your future stories? Was our reaction something we could meaningfully condense down to a sentence or two? Was there something in your cover letter that affected our desire to provide feedback? How hurried was I while sending out rejection letters? As you can see, many of these factors have nothing to do with your story. We offer feedback as often as manageable,3 but we’re not your critique group. The story didn’t suit our personal tastes. We found problems with the story. We’ve seen too many stories like this. The prose would require too much editing. The story felt more like fantasy or horror than science fiction. The style wasn’t a good fit for audio. This is fiction, not math: subjective taste is our only true yardstick. We encourage everyone to keep trying no matter what flavor of rejection they receive! Many of our authors received several rejections of various types before we bought one of their stories, and many of our staff still receive rejections from other Escape Artists podcasts. We try to go through the main queue from oldest to newest, but there’s a lot of jitter. For example, if one of us downloads 10 stories to their Kindle, the next reader might come along ten minutes later and respond to the 11th story. The workflow can vary if I or one of the Co-Editors plucks a story from the queue. This skips a story over one or more of the early tiers, but is not usually faster than the usual pipeline, nor does it necessarily affect the ultimate odds of acceptance. You may never notice from the outside. Special submission calls aren’t under my management. Artemis Rising generally follows a similar workflow, but has only two editorial levels, and tries to send more personal responses. We don’t recommend paying attention to your story status in Submittable. It can change from “New” to “In-Progress” for reasons related to your story’s place in the pipeline (e.g. an Associate Editor read your story), or completely unrelated reasons (e.g. a new person joined the Escape Pod team). From the outside there’s no way to tell the causes apart. Relax, be patient, we’ll respond as soon as we have information to share. This is an explanation, not a contract. This process was different in the past, and will surely change again someday. This entry was posted in Admin, Short Stories on February 5, 2019 by bckinney. Need snack on a long cold weekend? Now’s your chance to hear the Time Cookie Wars podcasted at last! Meet all your black comedy science fiction needs (and cookie hungers) via Tina Connolly’s wonderful reading in episode 208 of the Toasted Cake podcast. Time Cookie Wars is a story about… what it says on the tin. Wars, across time, for cookies. Though I suppose you could read my original story notes for more info on what brought us to levy such judgment on our past selves. P.S. I actually like peanut butter cookies. But they’re nothing compared to Milanos. This entry was posted in Publications, Short Stories on January 20, 2019 by bckinney. But don’t congratulate us yet. Because we – and our siblings over at PodCastle, who won “Best Speculative Fiction Story: Small Cast (Short Form)” – are declining our award. In short, the Parsecs gave an award to a notorious harasser and abuser.1 When they discovered this, their reaction was not to deny a platform and publicity to someone with years of documented abuse, but to double down on the supposed virtues of their anonymized process. Escape Artists co-owners Alasdair Stewart and Marguerite Kenner described our collective decision-making process here. PodCastle has released their own statement here. Alasdair earlier released a personal statement here. Escape Pod is still pondering a statement of our own, but given how good those statements are, it’s not clear how much brainspace we want to waste on this. But I wanted to add a personal element. There are a lot of ways to hurt and misuse. The Parsecs aren’t directly, obviously harmful in the way Writers of the Future is. But if we’ve (all, collectively) learned anything from the internet over the last few years, it’s that unmoderated spaces become spaces dominated by harassers and abusers. Bad actors drive everyone else away. If an organization refrains from passing judgment, then only the worst participants will have the will and power to make judgments. I understand the appeal and principles of above-the-fray neutrality. In practice, any organization must choose between those who would act abusively, and their victims. If you won’t banish anyone, the harmful people will do the banishing. Identifying the abusers isn’t always easy. But sometimes an abuser has a multi-year, media-documented history of threatening behavior, and the basic standard of care for your community is clear. Or certainly should be. For myself, no award is worth supporting an organization that would allow someone to hurt and misuse so many friends, fellow authors, podcasters, and human beings. This entry was posted in Admin on December 20, 2018 by bckinney. The Hammer’s Prayer, my short story about a golem secretly working in the depths of Logan Airport, is now live on the Diabolical Plots website! This story was previously available as past of the Diabolical Plots Year Four anthology, but now it’s online for everyone to read. This story is, I think, a brand new take on the golem myth. What if the word of life was no mere static gift, but a vibrant and contagious thing, begging to spread breath to new lungs? I showed up early for work, as always. The airport’s underbelly was the ugliest place in Boston, but I would’ve spent every hour there if I could get away with it. Among the hurried machines and distant reek-sweet jet fuel, I had everything I needed. A purpose, a paycheck, a place to hide; and most of all, a land of function without beauty, where nothing would tempt me to invest it with holiness and life. Further thoughts below the fold. No true spoilers, but why not read the story first anyways? This entry was posted in Publications, Short Stories on December 3, 2018 by bckinney. 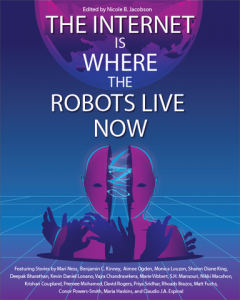 My science fiction short story, “Elegy of Carbon,” is now available in the anthology The Internet Is Where The Robots Live Now! 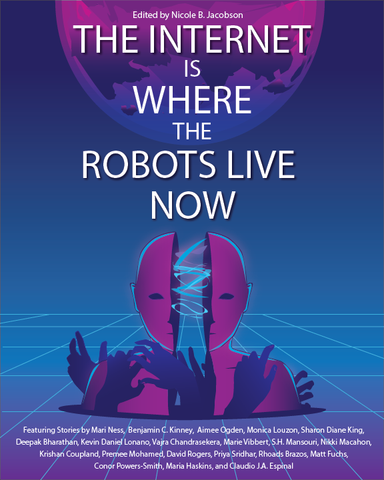 This exciting anthology offers 20 short stories about the intertwined lives of human and machine, from near-future to space opera. We are headed for convergence. The separation between mind and matter, robot and man, the artificial and the sublime is becoming less every day. Will the human race survive the reckoning? Will we crash into extinction or wake to a future beyond our current comprehension? Join Mari Ness, Benjamin C. Kinney, Aimee Ogden, Monica Louzon, Sharon Diane King, Deepak Bharathan, Kevin Daniel Lonano, Vajra Chandrasekera, Marie Vibbert, S.H. Mansouri, Nikki Macahon, Krishan Coupland, Premee Mohamed, David Rogers, Priya Sridhar, Rhoads Brazos, Matt Fuchs, Conor Powers-Smith, Maria Haskins, and Claudio J.A. Espinal as they tell twenty unique stories exploring the thinning space between human and machine. “Elegy of Carbon” is the story I like to call the Brave Little ToasterMining AI. The miner finishes its mission, no carbonaceous asteroids left in its territory to mine for diamonds. What, then, is a mining AI to do, in a solar system cold and empty yet very much still populated? This entry was posted in Publications, Short Stories on November 15, 2018 by bckinney. Toward Lands Uncharted, a short story of mine which has only previously been available behind paywall, is now free to read at Curious Fictions! Check out my original story notes here. And if you like this, you can buy a whole bunch of other excellent stories in this vein in the Mind Candy anthology from Myriad Paradigm Publishing. This entry was posted in Short Stories on November 8, 2018 by bckinney. My short story, “The Seeds We Plant,” is now available on Amazon as part of the Compelling Science Fiction special issue! This special was originally available as a companion for their anthology kickstarter, but now you can buy it directly. Contains five original short stories from Compelling SF authors, including Pip Coen, Deborah Davitt, Mike Adamson, Steve Wire, and myself. “The Seeds We Plant” is a story about brain-machine interfaces for emotional control: a neuroprosthetic device in the most literal sense, serving as an artificial (and externally controllable) replacement for a neural system that isn’t functioning as desired. This technology provides a way to guide and control a spaceship pilot, not by influencing their thoughts and actions, but by telling them what to care about. Which could be dystopic indeed. But what happens when the external control goes silent, and you have only your own implants to pull yourself toward some kind of salvation? The worst moment came not when the collision alarm flashed in his lenses, not when he slammed back and forth and sideways in his restraints, not when every screen went black. No, the worst moment came afterward, when Nathan tried to ride his adrenalinesurge toward the next action, and his fear dropped out from under him. His limbic net caught one last blip, a pulse of relief from the nursery, and then fell quiet. No fear meant no incoming signals–no equipment left alive in the ship, except in Nathan and the nursery. Read below for some more thoughts & references, including some extremely minor spoilers. This entry was posted in Publications, Short Stories on November 7, 2018 by bckinney. Today is the final stop of the Putting the Science in Fiction1 blog tour, where ten of its authors offer ideas and story prompts to help you get some exciting science ideas to help build your National Novel Writing Month (#NaNoWriMo) efforts – and offer you a chance to win a free copy of PSIF. As you may know, I’m a neuroscientist as well as a SFF writer and editor, so I contributed a chapter on Cyborgs & Cybernetics to PSIF. My chapter is an expanded version of my “Putting the Science in Fiction” blog post Seven Things Authors Should Know about Cybernetics, so take a peek there if you need a refresher. This topic covers everything near-future medical implants to space opera neurotechnology, so it’s a field rich with possible stories. Cybernetics – the hybridization of human and machine – is a staple of science fiction, from ubiquitous internet-access implants to the terrifying Borg to the differently terrifying ancillaries of the Imperial Radch. It’s easy to include cyborgs in a story: give a character a little bit of superhuman capability, maybe a little bit of discrimination or prejudice, a dash of handwavey Humanity Loss if you’re feeling cyberpunk. But who needs to stay bound by those shallow clichés? After all, not only is NaNoWriMo coming up, but even after it’s over, the next year is forecast to have 365.25 other good days to start a new writing project. Let’s dig a little deeper into what cybernetics might really mean for the recipients, society, and culture. I think we’ll find ourselves a rich vein of story prompts down here. I’m going to open three idea-mines for you, and I promise I’ll dig them deep. What might happen, then, if we change the brain? Perhaps we can add a new source of data – a new sense – to a newborn brain, and they’ll develop to adapt to it. Or worse yet, they might not quite succeed. After all, the brain isn’t infinitely changeable; an embryonic cow brain transplanted into a human body wouldn’t become a human. Plus, it’s not as if our brain is sitting around with spare capacity. Despite myths to the contrary,we use 100% of our brains, 100% of the time. 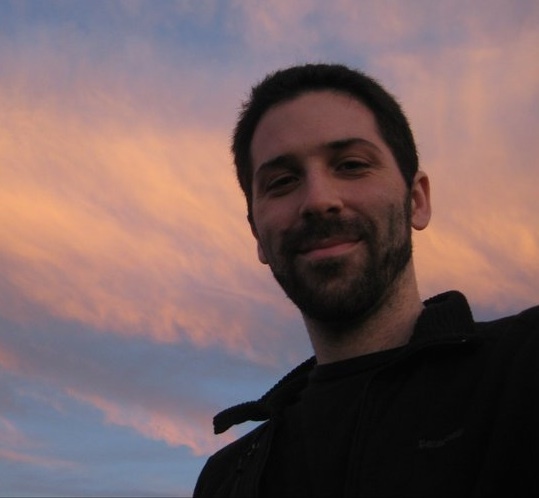 If we try to add more or different functions, will we simply fail? Or will we pay some other price, in the tradeoffs of brain development? It’s certainly a risky proposition. Almost certainly unethical. What pressures, then, might drive parents to make such a decision for their newborn child? As William Gibson once said, the future is already here, it’s just distributed unevenly. The first clinical trial of a human cybernetic implant– a chip implanted in the brain to control a computer – began in 2004. The current studybegan in 2009, scheduled to finish in 2021. It will be many years yet before these become a reliable, common medical device. Once the technology is established and safe, how will it trickle down into everyday life? Many technologies start among the rich, and slowly become cheaper as companies try to widen their markets. Medical technologies sometimes follow a different route, at least in the United States: if insurance will pay for it, it can become widespread regardless of price. But the medical market for these devices is people with spinal cord injuries, ALS, or other conditions that impair the brain’s ability to control the body. Even in the technology’s simplest form, controlling a computer cursor with the brain, who else might want that ability? Will America fill up with medium-rich workers who want an extra edge in the speed and precision of how they control their computers? Will there be advertisements out there to promise you all that speed and precision? Will the products really deliver on that promise, or will your cybernetic implant only save your wrists from carpal tunnel syndrome? What do you do if yours doesn’t live up to the promise? Or even if it does at first, what happens when your supplier goes out of business, and nobody remains to honor the service contract for the electrodes in your brain? Perhaps instead, the real market for cybernetics will be more physical: workers who not only type, but control machines. Perhaps you could control a crane as easily as you move your own arm. Will this transform blue-collar work into an exciting and cutting-edge field, or push them into the realm of the strange and reviled? The impact of any technology on society depends on the stories we tell about it. Space travel is the terrain of humanist adventure or fathomless terror. Universal surveillance is the tool of world-saving spies or a soul-crushing panopticon. Even a technology’s mere presence onscreen can affect society: eyeglasses became more popular after they began to appear in silent film. How will movies, books, and other media reinterpret these changes for the mass audience? Will they tell stories of cybernetic implants as a tool to help people, or a tool of control? Will they be ordinary, or a sign of villainy? Hollywood persistently and harmfully portrays disability as a sign of evil. Will cybernetic implants be portrayed as another tool for horror-movie clichés to terrify their victims, for dystopian societies to alter or police their citizens, or as an ordinary part of how we help human bodies – in all their diverse shapes – interact with the world? We can shape the societies within our stories, but we can also shape the one outside. The next generation of stories are ours to write, starting this November and every day thereafter. This raffle is your chance to win a free copy of PSIF! This entry was posted in Books, Science on October 24, 2018 by bckinney.